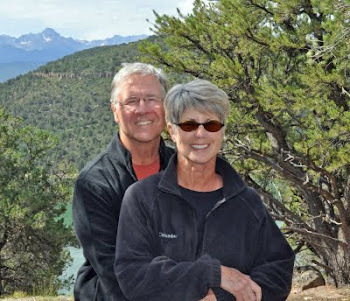 Find us on Google+ Rick and JoAnne's RV Travels: Elephant Butte, a Museum, an International Heritage Center, an old Fort, a National Wildlife Refuge and a Great Hamburger. Elephant Butte, a Museum, an International Heritage Center, an old Fort, a National Wildlife Refuge and a Great Hamburger. We are at Oliver Lee Memorial Park for the next several days. 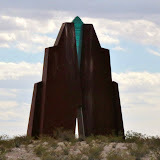 But I need to backtrack and let you know about some fun adventures we had while staying at Elephant Butte State Park in Truth or Consequences (T or C as the locals refer to it). We chose to stay in the South Monticello Point campground, which is close to 10 miles from the park entrance and main camping area. Why? Because it is more remote, and less congested. We were in site 19 right on a point overlooking the lake. It was a great location and we can only imagine how great this area would be if it were not suffering from severe drought. As you can probably tell from the pictures the lake is very, very low – pretty sad actually. Yet, this was a perfect home base for exploring the area. We already blogged about our trip to Chloride but that was not our only adventure. One of our first stops was the Geronimo Springs Museum in historic T or C. This little museum was a pleasant surprise. Its displays covered the history of Hot Springs from prehistoric times thru its rich Native American heritage, Hispanic explorers, to the more recent change in its name to Truth or Consequences – thanks to Ralph Edwards and his TV show by the same name. We were very impressed by there collection of pots dating back to 200 AD. Next we headed to El Camino Real International Heritage Center. You know about William Bradford and the Mayflower Pilgrims starting Plymouth Colony. But have you heard of Don Juan de Onate and his colonists traveling from Mexico under the Spanish flag on a route that had been used for centuries by Native American tribes through what is now New Mexico and founded the community of Socorro. He did this in 1598 about 20 years before the Pilgrims stepped foot on Plymouth Rock. The route they were following was named El Camino Real de Tierra Adentro (The Royal Road of the Interior). The trail has a very long and rich history and played a key role in trade and the establishment of what is now the southwestern United States. For example, it was the Spanish that introduced horses into North America. The trail was used continuously until 1880 when the railroad replaced it. In 2005 this center was created to both study the history and provide an educational experience to visitors. If you are in the area this is a place you don’t want to pass up. Interestingly enough is sits right along I 25 – the modern version of the original trail. So, now be honest… How many of you learned about this in you high school American history class? Moving right along – we headed to The Fort Craig National Historic Site. This fort was one of 8 that were situated on El Camino Real de Tierra Adentro that were designed to protect travelers and settlers. Perhaps its main claim to fame is that it was host to the largest U.S. Civil War battle in the Southwest. A very helpful volunteer and Fulltime RVer explained the Fort’s history and gave us some tips for walking the grounds and seeing the ruins. Personally, I can’t imagine how rough life would have been being stuck out in such a remote, harsh, windy, and dusty place. It was now late afternoon but still figured we had time to make a quick stop at Bosque del Apache National Wildlife Refuge. We had been there years before and so we knew better than to think you can stop at such an expansive refuge for a short time. This place needs at minimum a day but really several days to be explored and fully appreciated. Oh well… We drove on of the loops and watched all the busy duck and shore bird activity. Ok, now we are really hungry. Where should be go? About 8 miles up the road from the Refuge is the very tiny town of San Antonio. But is home to the world famous Manny’s Buckhorn Tavern – and #7 on the top 100 best hamburgers in the US. Yep, the Green Chili Cheese Burger. Check it out. Looks delicious! Looking forward to traveling through there in a month! Much more to see around here than you might first think. Travel Safe. It is amazing how neat museums are in these little towns. And every town has one! You've definitely been learning a lot about the history of the area in your travels. Thanks for teaching us as you go! Yes, the museums are very often a labor of love buy a group of devoted volunteers. These are very often great finds and the staff is typically great at sharing the local history. Cannot believe how LOW the reservoir in Elephant Butte is...almost scary! Lovely set of pics & info on the area. Making me long to go back there. Nina, it was scary! NM is suffering a multi-year drought. Not good. Is that burger meant for one person? I can only eat a quarter of that...looks very yum yum. It may be another year before we head back west but we will devote lots of time in NM the second time around and will note your interesting adventures. There is certainly some interesting history associated with NM. While its "beauty" is very different - it can grow on you and we have found some amazing camp sites. BTW - we are enjoying your posts and reliving our trips long the gulf coast. Trave Safe.